One of the fastest growing energy markets around the globe, as the Sun is the cleanest, most abundant renewable source of energy available. Concentrated Solar Power (CSP) Plants, also known as concentrated solar thermal, combine three major systems to produce electricity by collecting and concentrating sunlight with mirrors and lenses in a Heat Transfer Fluid (HTF). Through a heat exchanger system, pumps move the HTF to heat water and generate steam. The power block then uses that steam to generate electricity through a turbine generator. 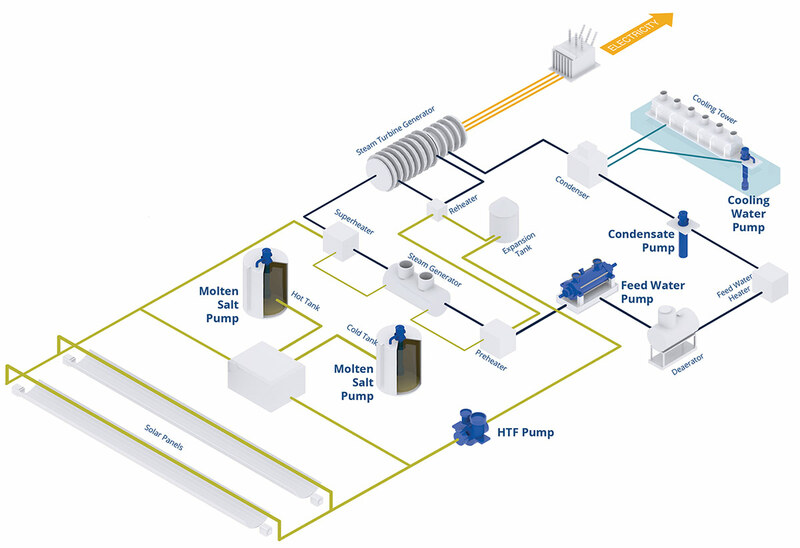 Throughout these systems, pumps operate in services such as: molten salt, heat transfer, boiler feed, condensate extraction, cooling water and auxiliary services. Due to its nature, CSP plants depend a lot on direct solar radiation. They have a variable operation, with a daily start and stop, and require heavy-duty pumping equipment cabable of handling high temperatures and pressures. To increase efficiency, concentrating solar power plants store the heat obtained during the day in molten salts, enabling them to continue to generate electricity even at night. Molten salts can reach temperatures as high as 1100°F (600°C), which demand for highly-engineered transfer pumps [see VLT pump]. Ruhrpumpen's experience in the power generation market has provided highly-engineered and special-purpose pumps for CSP services. ANDASOL III, developed by Solar Milennium Group, is a CSP plant in Spain with the capacity of delivering electricity to 200,000 homes. It relies on a HVN 12x17 pump for the as the heat transfer fluid pump of synthetic oil through the parabolic troughs. Due to the variable operation and daily starts and stops, along with temperatures as high as 750°F (400°C) that needed to be met, Ruhrpumpen selected this HVN pump with casing and impeller fabricated in chrome steel, plus cooling systems and variable frequency drives. Our VLT model can operate as a molten salt circulation pump in heat transfer and thermal storage systems. Moreover, its special first stage allows operation with extremely low NPSH requirements, making it perfect to operate as a condensate pump. With special materials and design considerations, our HVN and J Line pumps can handle synthetic oil as the heat transfer fluid in high temperatures. Designed to meet the pressures and temperatures generated by a heat transfer medium, it makes for a good fit as an auxiliary service pump for HTF. A heavy-duty pump designed for high pressure applications like boiler feed and pumping of cooling water.